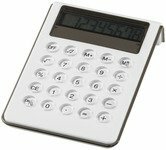 Desktop promotional calculators are a great giveaway and can be used for a range of advertising and promotional campaigns. 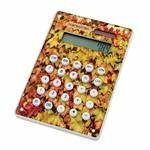 We supply solar powered and battery powered calculators as well as novelty models. 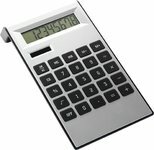 If you cannot find the branded calculator you need please contact us as we will be able to source the item for you. All pricing includes printing with your logo and imprint with items marked “POA” priced on application. If you need a sample of printed calculators we have done for other companies and organisations please let us know. Looking for the perfect promotional stationery item for an office desktop or service counter? 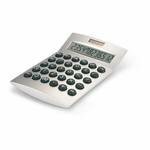 Take a look at our range of branded calculators. Numbers are a part of our everyday lives. Whether it’s adding up the latest sales figures or balancing the cheque book or bank statement, we all have to work with numbers at some point. 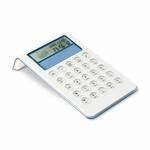 Printed calculators are also a brilliant choice for schools,colleges and even universities. Every maths department would love to be able to hand out printed calculators to students. They will receive their very own personalised calculator to help them with all their maths equations, and your brand will be promoted whenever they use their calculators. 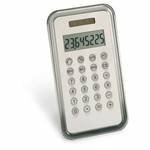 Desktop and pocket calculators are a great item for promotional giveaway campaigns and can be used in a wide variety of office and service counter ways. On the desktop a calculator is always visible showing your logo. On a service counter the same true and can be seen by both clients as a way to promote your brand. A good example is a tyre depot with a tyre manufacturer branded calculator. As the tyre fitter calculates the final total bill for a replacement set of tyres the brand on the calculator is seen by the person who just had them fitted to their vehicle. This is an example of brand reinforcement and it is a known marketing technique. Another aspect to consider is whether you want solar powered calculators. This can introduce an eco-friendly aspect to your marketing campaign and one where no batteries are required. The power comes directly from the light the calculator is exposed to. So this type of solar product is great but not in the dark unless it has an internal back-up battery. Finally consider the size of the calculator keyboard. Some people including the elderly and those with poorer sight may prefer a calculator with a larger keyboard and one with more touch feel to the keys than a smaller and harder key type. Sound good? 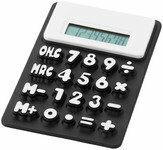 Then invest in our logo printed calculators today and start helping your customers or employees with all their numerical tasks. We supply both solar powered and battery power calculators. Solar powered calculators may be considered more eco-friendly but may not be as practical as battery powered calculators. How fast can you deliver express calculators? When you order calculators in quantity we may ship from UK stocks or if there is a long enough lead time have them manufactured and imported to the UK. Express delivery calculators are shipped from our UK stock and can be delivered within 1-3 working days dependent on artwork availability and sign-off. How are calculators packed for shipping? Our calculators come in individual packing, normally in a bubble wrap inside a cardboard outer. The calculators are then packed in quantity into boxes for shipping. The individual packs protect the calculators both in transit and during distribution.